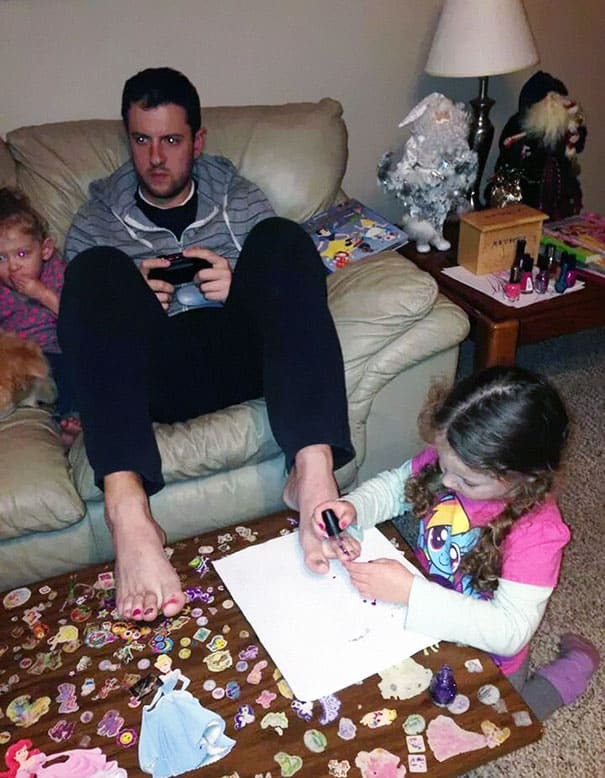 Not everyone is cut out for fatherhood. However, there is a chance to change that, and there are more than a few fathers out there who are willing to go above and beyond to ensure their children – boy or girl – are as happy as possible growing up. It takes a special kind of person to let their daughter braid their hair, paint their nails, or sit through a tea party on the living room floor. You can bet not a single one of the following fathers regrets their decisions, however. In fact, these guys are probably having more fun than ever. If you’re growing up with a little girl, chances are they’re going to find the make-up in mommy’s room rather interesting at some point. Thankfully, you’re there to ensure she gets it right the first time she applies it to herself. Of course, that means you have to take one for the team and sit peacefully as copious amounts of color is painted onto your face in odd lines. It may look a little ugly, or like clown make-up, when it is first applied, but give it a few weeks. 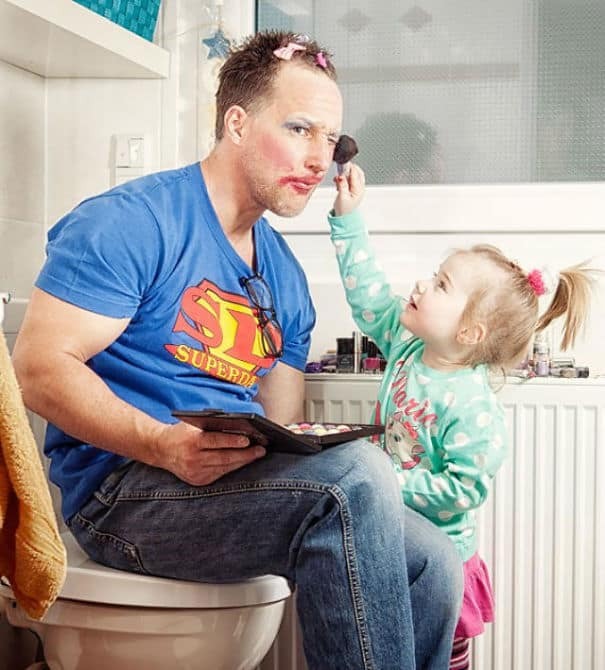 By then, your daughter is going to be a professional, or you may find a substitute to sit in while you enjoy the view of someone else getting their face caked with various forms of colored make-up. Again, growing up with a young daughter offers a lot of surprises, like getting your hair done by a semi-professional for free. 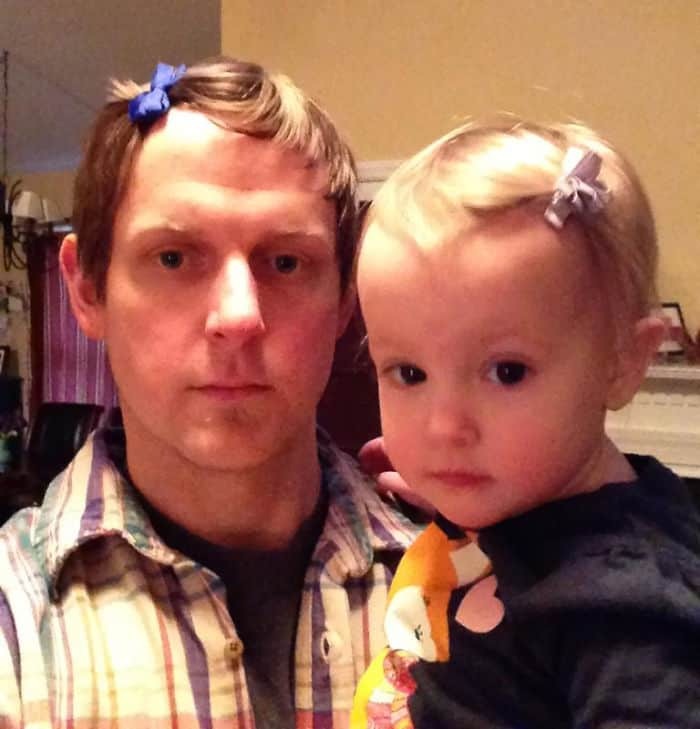 Honestly, who else was going to put a purple bow in your hair if it wasn’t your daughter? No one, that’s why, so wear the matching bow with pride! If you want to make things even better for her, allow her to apply the bow in your hair herself. While it may be fun to share the same hair-style for a limited period of time, having her know she was the one who did it for you may make her day far better. The smiles won’t stop as she looks on in joy at her handy work. 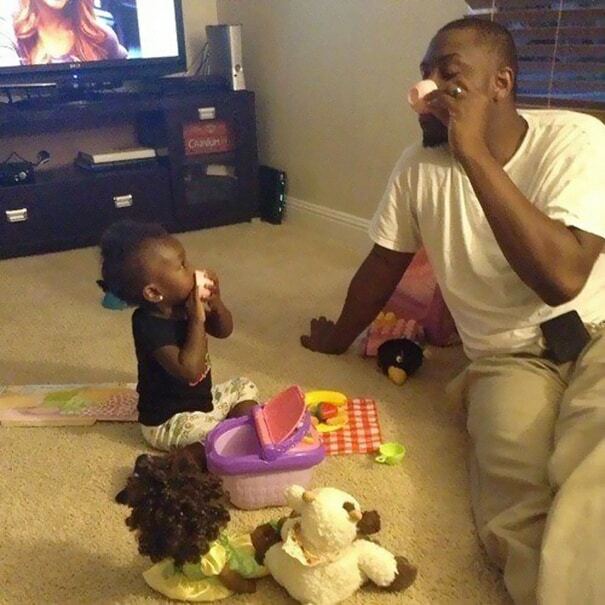 It doesn’t always have to be the father on the receiving end of the make-up, hair accessories, or nail polish. 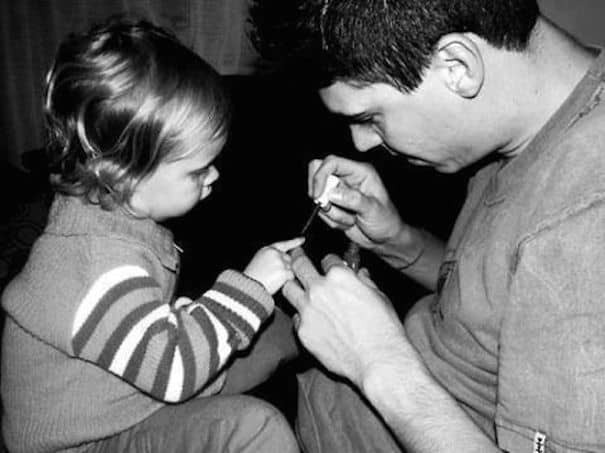 Instead, sit down, take the time to pain her nails and remember the beautiful memories being formed by the both of you. She’ll probably want to do yours after, though. It will pry be wise to just let her, of course, as she is going to whether you like it or not, you may as well enjoy the time spent with her. If you have a favorite color you may want to make it abundantly clear ahead of time, otherwise you could end up with a really horrible shade across all ten fingers or toes. She’s the queen of the tea party, as the myriad of toys will attest to. 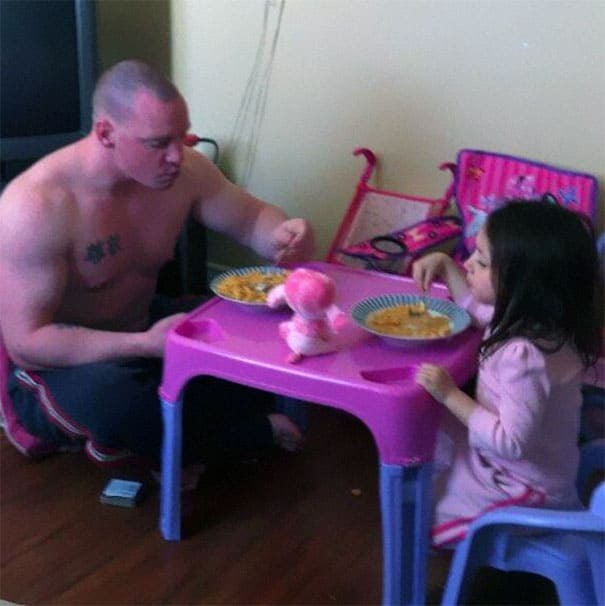 It takes a big man to take a seat and drink imaginary fluids from a pink cup, but it’s one a father should be doing anyway. If you want to spice things up at the tea party just a little bit, then fill those cups with some juice, anything real. While it could end up with a mess, the experience may be a little more real for her, as she is really drinking alongside her father from tea cups. Perhaps afterwards a picnic can be had with the fake fruit on the little plastic plates in the center of the room. Perhaps it is too cold outside, or maybe its raining, or perhaps this is just a lot funner than a regular old plastic swing set. It may hurt in the morning, but her smile will warm the pain away. Just be careful not to slip and fall off the chairs, otherwise it’s going to be a bad day for everyone involved. 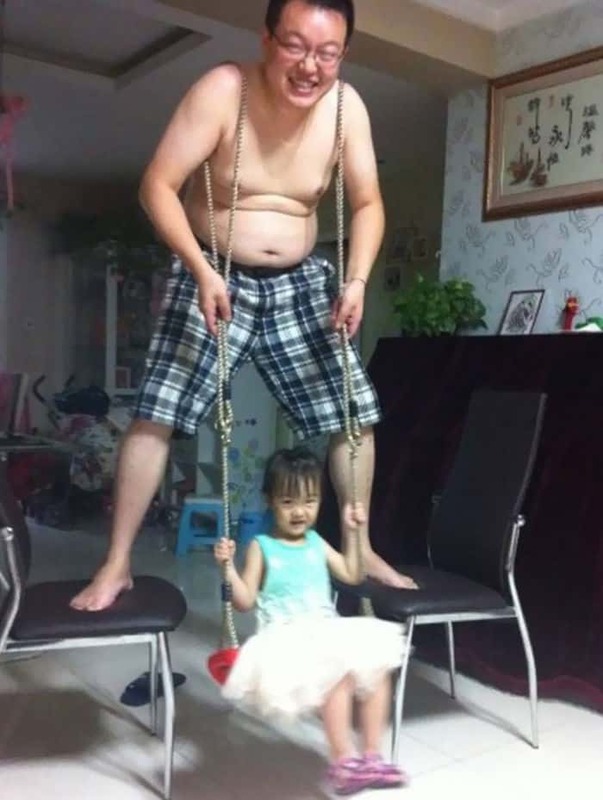 Unfortunately, if you have more than one child, this makeshift swing set could turn into an all day affair, with you stuck in place while the children take turns swinging back and forth by the ropes over your arms. It will be painful, but it will be fun. Kill two birds with one stone. The chance at getting some relaxation in during the day is far and few between for a father of multiple kids, but ensuring the children are sitting quietly while you take some much needed rest isn’t difficult. Take for example the infamous nail polish. Let them slather it over your toes and everything within the house will be quiet and happy. Or, if you’re feeling brave, let them try to pain pictures into the nail and end up with some form of fantastic art to show off at work or to your friends. Wear the coloring with pride, though, as she worked hard to ensure you looked pretty. There comes a time in everyone’s life when the thought of a picnic is perhaps the best thing to happen to your day. For a young girl, that picnic could be on a daily basis. Thankfully, the food at this picnic is real instead of plastic fruit. Bring up some interesting conversation about the color pink and you’re in her good graces for life. If you want to make the day a little more special, cook up a fancy dinner and a desert, perhaps, and then sit down to enjoy a real meal that goes beyond cereal. Just a tip, her favorite foods will win her heart while you’re enjoying the comforts of the floor for the evening. 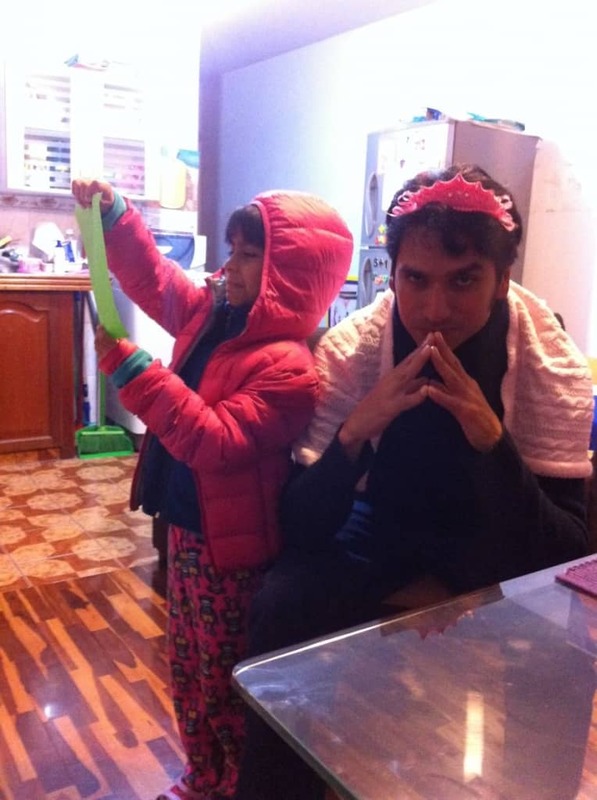 Before fatherhood, the idea of embarrassing yourself in public was one of the most hated ideas. That all changed, however, as a young girl doesn’t need to be wearing those short jean shorts. 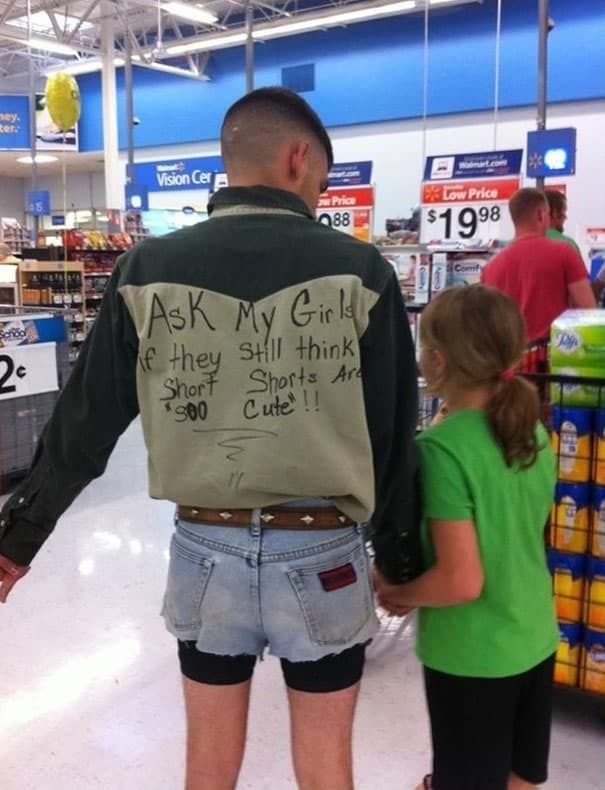 Prove to them, and everyone within Walmart, that you can’t pull those tight shorts off, and neither can they. Some lessons have to be taught the hard way, and if it means you get a few years of peace, then so be it. It may be embarrassing to them, too, but they’ll look back on the entire event and laugh at some point in the future. Of course, if they own a smartphone you won’t ever live the day down, either. If you have a t-shirt with an entire race track and small village printed on the back, you’re already winning in their eyes. 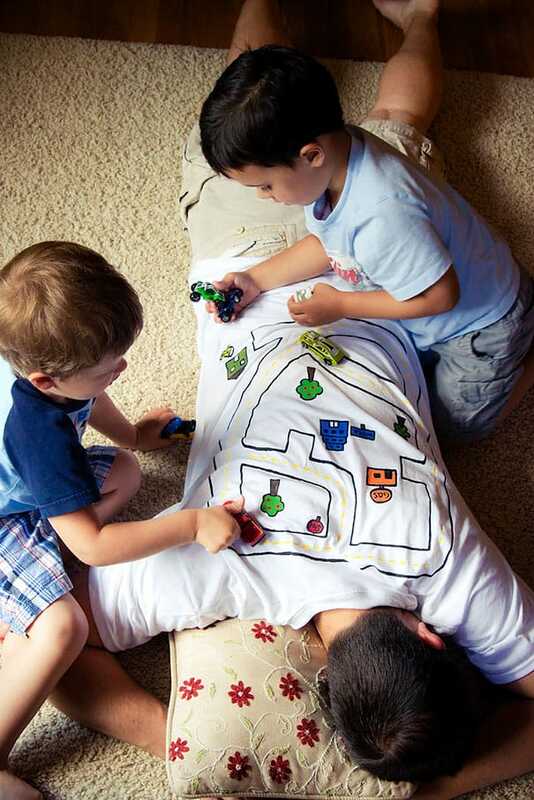 Take a rest, lay on your stomach, and let the kids go to town as they drive their plastic cars across the contours of your back and shoulders on their favorite race tracks. If you want to kick things up a notch, provide the sound effects to their vehicles, or to the entire race, such as an announcer, and you can win yourself a dad of the year mug at some point in the near future. Chances are this will end with more cars being purchased from the toy store, though, so be wary. A plane is small, and children enjoy running about wherever they can. So, why not get them to sit in a comfortable spot while entertaining them in the slightest way possible, too? 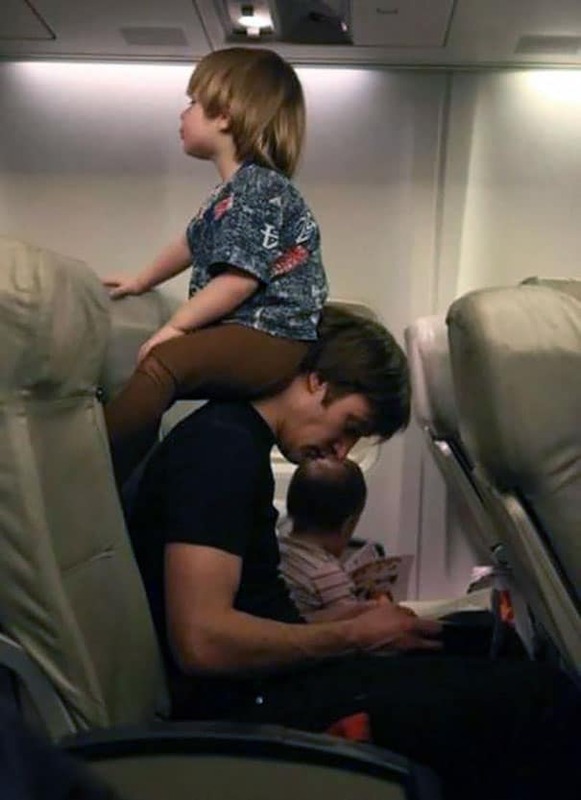 Lean your head forward, let them scale you like a jungle gym, and enjoy the quiet as they search the rest of the plane from above. Again, a plane tends to be a horrible place for children, as the passengers don’t want them around, generally. Entertain them through the entire flight and you’ll win their heart, and that of the entire crew and passengers, too. Your neck may hate you, but he won’t. Don’t make her stand. That seat is only big enough for one of you, not both, so ensure she is sitting comfortable while you crouch on the dirty floor of a subway car. Pull out one of her favorite books to make the train ride pass by even quicker, and you’ve found yourself winning the day. 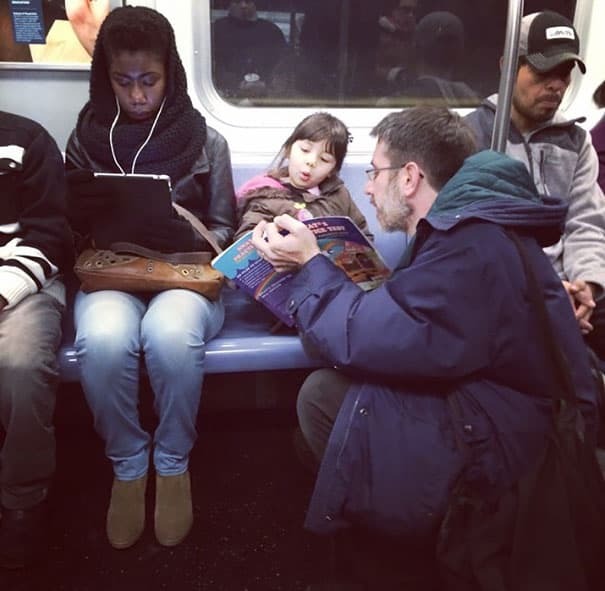 It may look a little awkward to everyone else on the train car that day, but they don’t matter, only she does. A train isn’t overly enjoyable for many, so taking her mind off the ride will benefit everyone in the immediate area. They’ll thank you silently. How many adults can say they get the chance to dress up in a costume constantly? Not many, that’s why you should jump on the chance to throw on a fake crown and cover your shoulders in a makeshift cloak. Of course, she’s going to order you around, even if you are royalty. Just remember, the crown won’t be yours forever. Eventually, your child may want to usurp the throne, then things will get interesting for everyone involved in the taking of the kingdom. Make an entire day out of the game. Take it in strides. But let her win. It really doesn’t matter how old you are, as once in awhile everyone wants to feel like a grown-up. However, when something like that happens in your youngest daughter in the middle of the story, like, say they want to push the car for the first time with you riding in the children’s seat, you should be all too happy to oblige. Why not? You get a free ride, she gets to find out why pushing the car may not always be a fun experience. 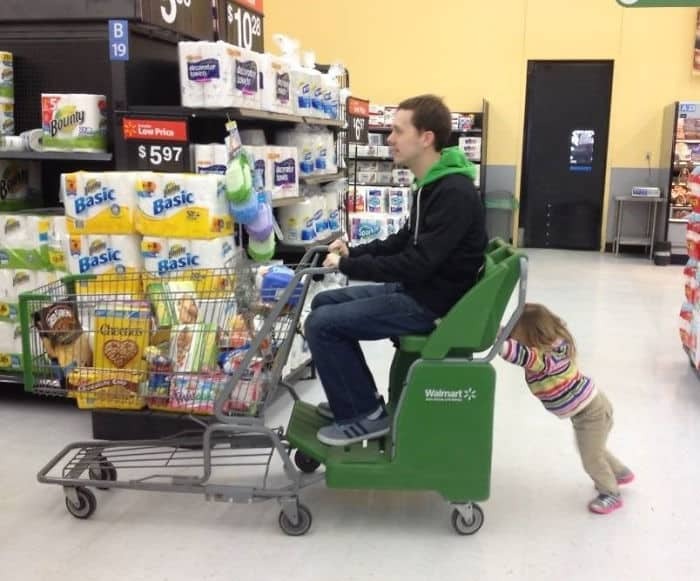 Of course, the complete opposite may happen, too, as she may end up loving the experience and wanting to push the shopping cart every time now. Leading an active lifestyle is important these days, but not everyone can say they can surf with the best of them. However, when you’re as young as this girl, the world is your oyster. Literally, as surfing is an incredibly difficult sport to pick up. Teaching her young will ensure a professional is made in the future, but also someone who enjoys getting outside and finding the time to enjoy the little things in life, like the perfect swell. Just remember, those colorful safety bands are a great investment while heading out into the water with someone so young for a surfing lesson. When the mother is away, the boys will play. That’s how everyone expects things to go down when the wife ends up leaving for a period of time – long or short. The fun will commence, as bath time can be hilarious for everyone involved, not just the child with the toys in the tub. 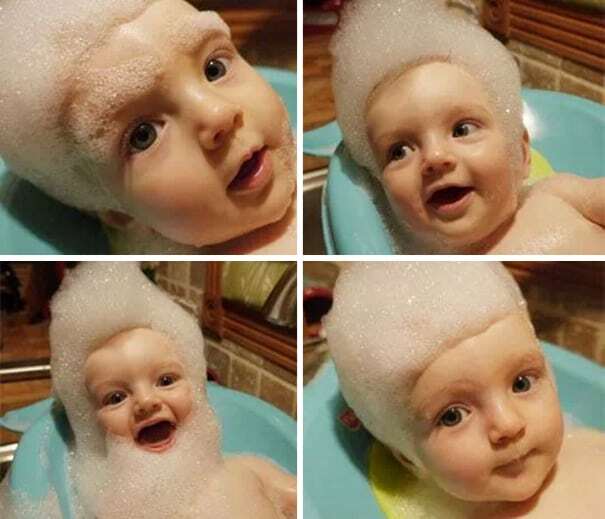 With some perfect sculpting skills and a handful or two of bubbles, your young son could end up looking like Elvis Presley reincarnated. If you want to get things wild, however, attach a beard or some massive eyebrows to the kid. He’ll love that, we promise. Just make sure to buy the type of bubbles and soap that doesn’t burn their eyes, or that fun will soon turn into a dark night.